Exhibitions are the best face-to-face marketing opportunity for companies around the world. They provide outstanding sales, marketing, research, branding, financial, and other rewards for companies that understand some important exhibition marketing fundamentals. Executive decision-makers consistently rank exhibitions as their “Number One” choice for obtaining purchasing information — beating out 12 other business media choices, including direct mail, advertising, telemarketing, etc. Exhibitions are the only sales and marketing medium that delivers a pre-qualified visitor to your company’s stand in a face-to-face selling environment. And these visitors, invest their own valuable time and expenses to be at the exhibition. This is truly an outstanding marketing opportunity. Peter Drucker, in his book Post Capitalist Society, calls this new century the age of specialization and knowledge. “We no longer make or move things; we apply knowledge to knowledge.” And because exhibitions are the prime opportunity to accomplish this, UFI, The Global Association of the Exhibition Industry, presents this marketing resource for exhibiting companies and exhibition organizers, who can share this information with their exhibitors. Much of the research data is based on studies originally performed by the Center for Exhibition Industry Research (CEIR), based in Chicago, Illinois, USA. Choosing the best exhibition that matches your company’s sales, marketing, branding, or other objectives is your first step toward success. It is a challenge, however, since there are an estimated 30,000 business-to-business exhibitions held each year all over the world. 1. Focus on those global exhibitions offered in the industry sector that are appropriate for your company. 2. Evaluate these exhibitions according to their importance within that sector, as well as their local, national, or international appeal. For example, how long have they been operating? 3. If your competition is exhibiting in these events, it may be a good indicator that you should consider exhibiting. 4. Carefully review the audience demographics (the published metrics or data about the visitors, exhibitors, press, VIPs, etc.). The exhibition visitor profile should offer your company a good potential for making sales or gathering sales leads. Do your customers attend the exhibition? 5. If your focus is on company branding, these visitor metrics should help you determine if there is an opportunity to achieve this. 6. Be sure that the company producing the exhibition has a good financial reputation. Find out how long they have been in business. 7. The total geographical area served by the exhibition should match your marketing needs. 8. The facility where the exhibition will be held should be evaluated, particularly for its technology offerings? 9. Evaluate the city where the exhibition will be held – are there good hotels nearby? What about entertainment opportunities for meeting with your current customers? 10. Consider accessibility to exhibition by air, rail, auto, since this will affect attendance. Are there other transportation options available? 11. Evaluate the support services offered at the exhibition. For example, translation services are usually required. 12. Finally, the time of year the exhibition will be held and political considerations can be important factors. 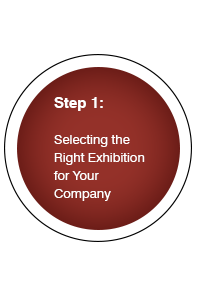 After a thorough study, contact those exhibitions that are appropriate for your company’s marketing goals and needs. Remember that exhibitions are about making sales immediately, or significantly shortening the sales process for future sales. 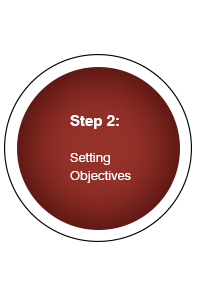 The second step toward exhibiting success is establishing objectives for your company’s participation. The sad truth is that 71 percent of exhibiting companies do not set objectives or plan strategies for their participation. Even worse, only half of these companies with objectives ever follow through on their stand. However, those companies that establish and measure objectives consistently achieve great success. Objectives provide direction for every aspect of your company’s exhibition participation: your marketing strategies, branding plans, budgets, exhibit architecture, graphics, products, literature, IT support, and the necessary staff. Objectives & Sales: Objectives also stimulate sales performance in the stand, particularly if they are measured in terms of their quantity and quality of contacts by the staff. This means you should turn your company objectives into personal goals for each member of your staff to achieve at the exhibition. Research consistently proves that successful exhibiting companies make sales related objectives their priority. 1. Increase sales through new orders or qualified trade show leads. 2. Introduce new products or services. 3. Enhance your relationships with current customers. 5. Obtain contact names for the company’s e-mail list. 6. Open new markets or territories. 8. Check out the competition. 9. Enhance the company image or brand. 10. Conduct sales meetings in conjunction with the exhibit. 11. Provide education to the visitors. Target marketing is the next important step in the exhibition marketing process. In theory, it’s quite simple: you contact the visitors you want to see at an exhibition and tell them where your stand is located and what you are exhibiting, branding, demonstrating, etc. 1. Buyers and/or specifiers of purchases, some of whom will be attending for the first time, while others are loyal visitors, returning year after year. 2. Press representatives (both print and electronic). 3. Very Important Persons, VIPs or Opinion Makers. 5. Students, who may be influential buyers in the future. 6. Others involved with the industry. Actual Target Audience It is important at this point to be realistic about the number of visitors you can expect to meet at any exhibition. You and your team must understand that not every visitor has an interest in what your company is exhibiting. In fact, research proves that approximately 15 percent of an exhibition audience has general interests in any product or service category. To be certain in your exhibition planning, consider 10 percent as your specific target audience. Read Part 2 of the Complete Guide to Successful Exhibition Marketing here.